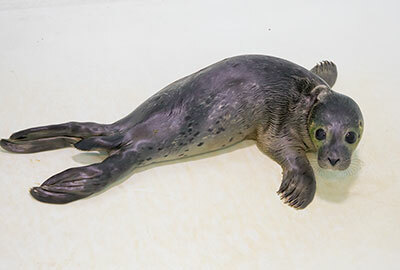 Mosh, 4-5 days old female common seal pup, was rescued on 13th June 2018. It is suspected that she was abandoned by her mum or they were separated by the tide. Even though she spent 24 hours all on her own, she seems to be in good condition and ready to be fattened up! 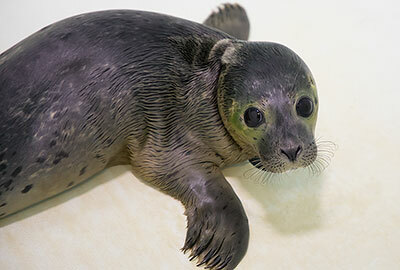 When Mosh first arrived at the seal hospital, she had a special fish soup mixture every 4 hours until she was old enough to eat fish for herself. Once she has recovered Mosh will be returned to the wild in the next few months. Click here to see larger version of this and above photo of Mosh which were taken on 17th June 2018. Update - 2nd July 2018 : Mosh sadly passed away on 30th June 2018; it is always very sad when one of the rescued pups dies but sometimes these little ones just don´t have enough antibodies and strength in them to pull through, despite the best efforts of all the staff at Hunstanton SEA LIFE.